What a happy evening. 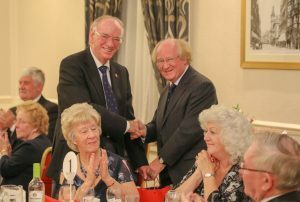 Last evening there was a celebration dinner following the Silurian Royal Arch meeting, celebrating the long service and dedication that W. Bro. 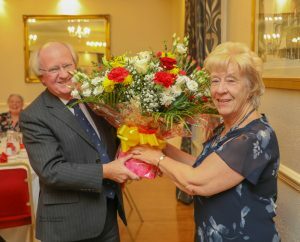 Robert Arundel had given to the Province over the 19 years that he had been on the executive of both Provincial Grand Lodge and Provincial Grand Chapter. 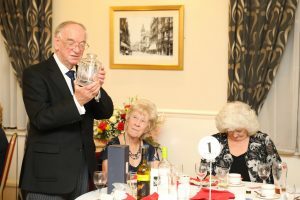 The evening was well attended and both he and his good lady wife Margaret appreciated their gifts. I’m sure he will continue to support the Province for the foreseeable future. Pictured is the RW PGM Richard G. Davies making the presentations during a very appreciative speech concerning W. Bro. Roberts dedication to Freemasonry in this Province and beyond.